As I wrote in this week’s “Treasury Tuesday” post summer is coming. Honestly, y’all. Even if you had a White Easter, summer really is coming. It seems like a lot of people are ready for summer, too! 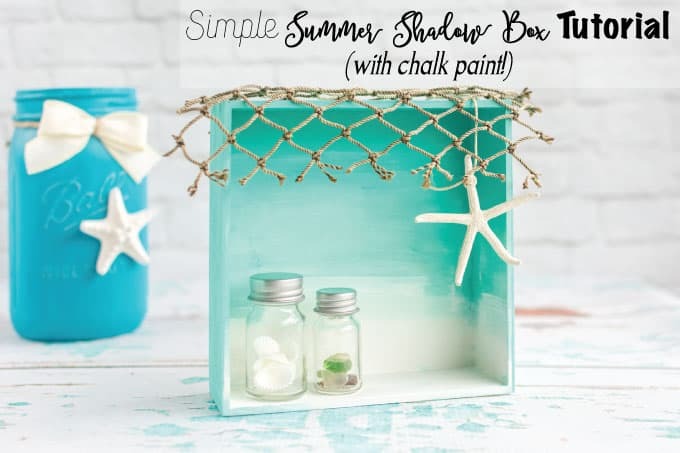 To tide folks over, I decided to share a simple summer beach shadow box tutorial. 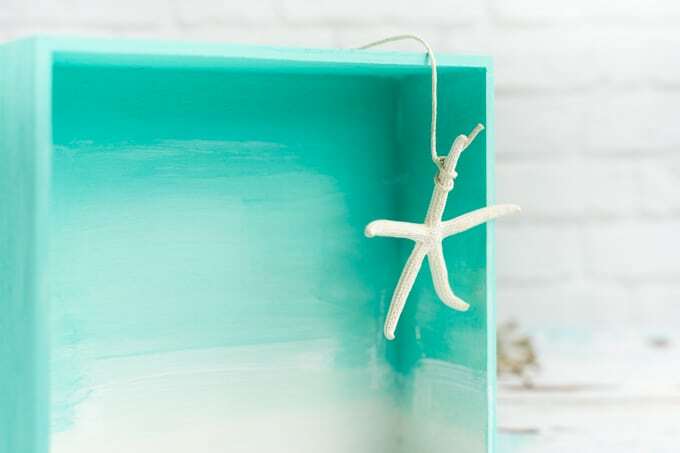 All you really need for this project is a box of some kind, paint, and embellishments. I used glass bottles with shells and glass, a bit of net, a starfish, and some hemp twine. 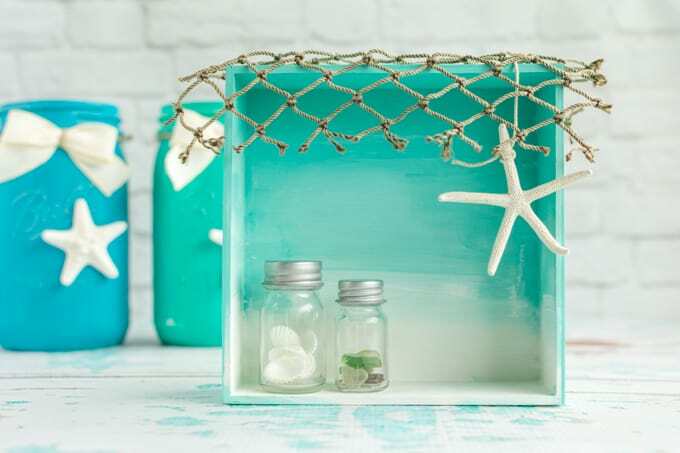 You can also use larger shells, sand, and even stickers or paper embellishments. 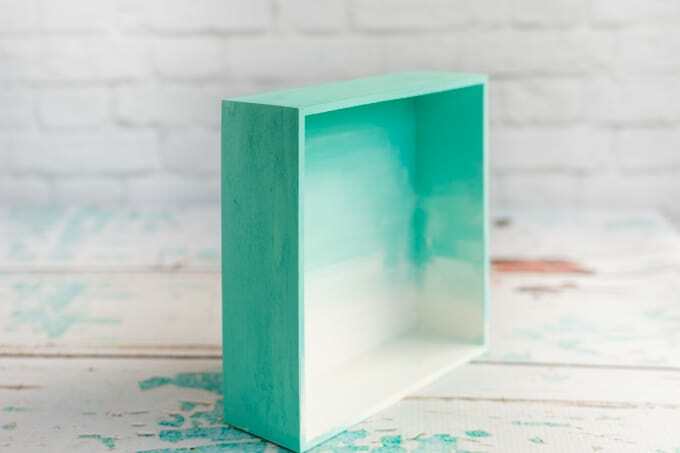 I picked up this little open-top box at the local craft store and, logically, when I sat down to write this tutorial I couldn’t find anything like it online to link up to! It’s just a little 6″x2″ unfinished wood box and unfinished wood items are really popular, so they probably have something similar at your local craft store. 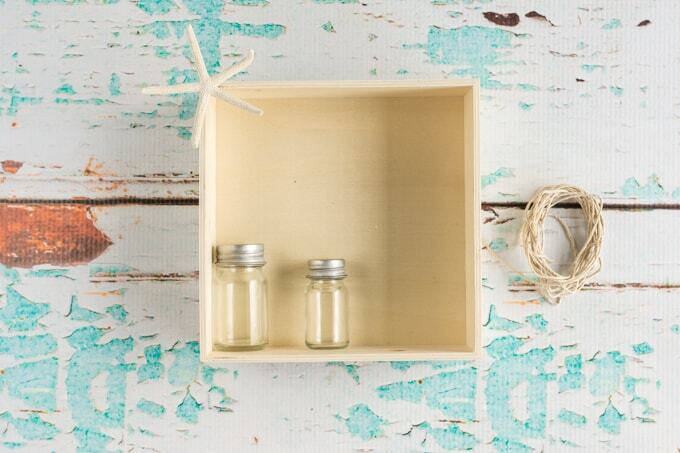 If not, you can always take the top off an unfinished box, find a small shadow box, use a picture frame, or even upcycle a cardboard box. 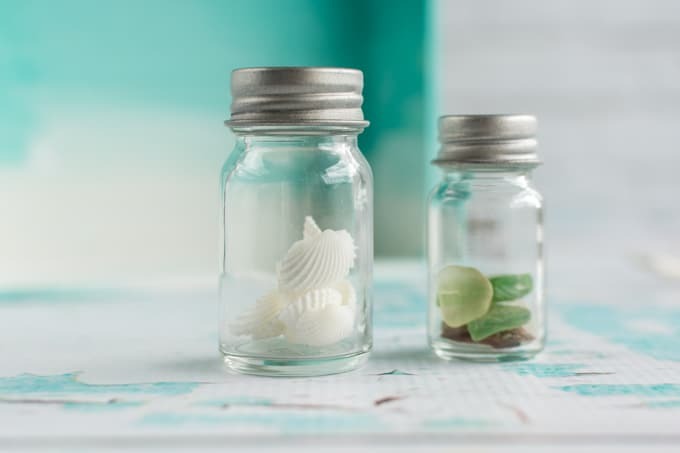 Small glass bottles are pretty popular right now for jewelry and fairy gardens, so they should be easy to find, as well. 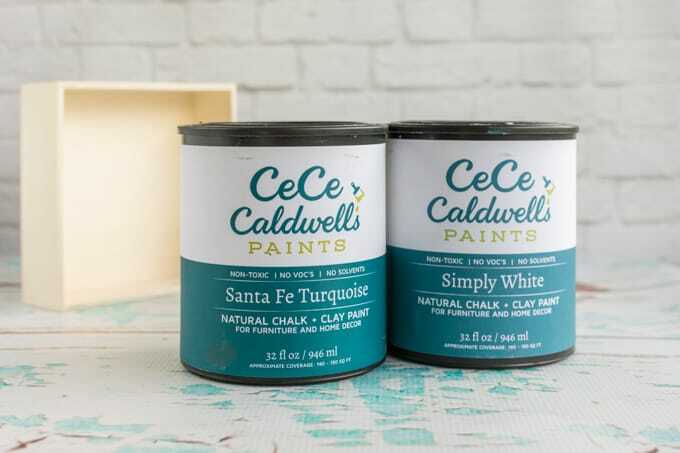 I used my new favorite paint: CeCe Caldwell’s chalk paint! I decided to take the plunge and buy some online because I kept reading about how the coverage is great, it doesn’t have any funky chemicals, etc. I shopped online through the Glitterfarm in California and was super impressed by how fast the owner got everything packaged up and shipped out. That’s not an affiliate link or anything – I’m just enthusiastic about both the paint and the Glitterfarm’s service! The chalk paint is really thick so it dries quickly. It also has absolutely no VOCs or solvents and is colored with natural minerals. Pretty cool, right? You can totally use acrylic paints, though. 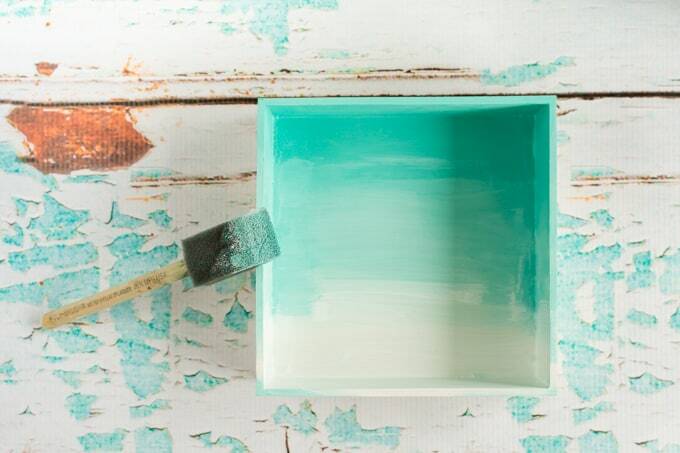 There’s no need to mail order chalk paint just for this project! No matter what paints you use, I recommend a blue or turquoise and white. You also need three foam paint brushes. 1. 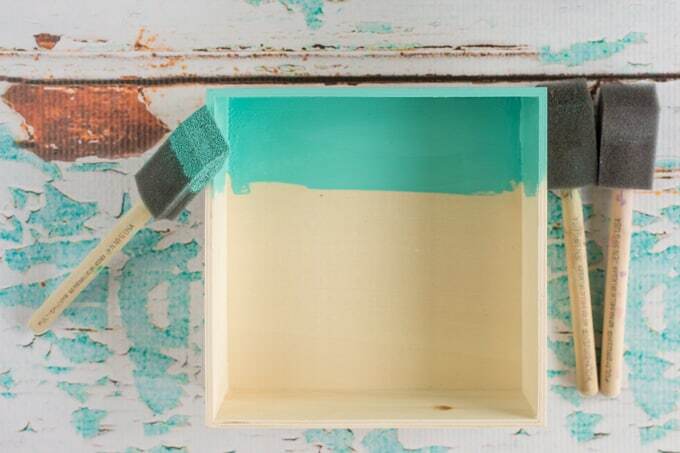 To get started, paint the top 1/3 of your box with your blue shade. Make sure to paint the sides and front edge. 2. Then paint the bottom 1/3 white. 3. 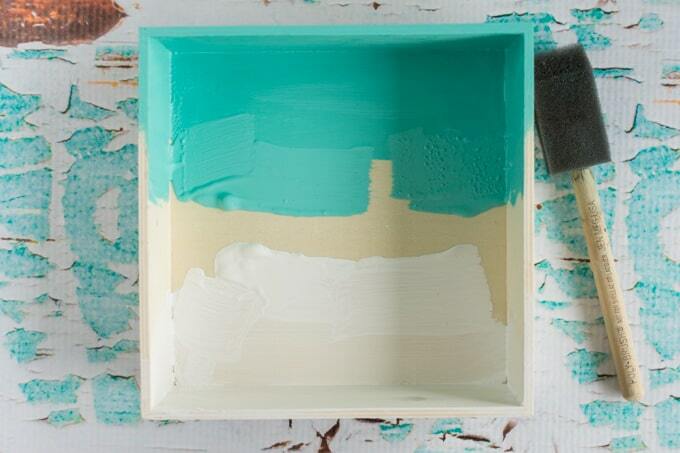 Load up the blue brush and the white brush and add a bunch of extra paint. The white typically gets washed out easily, so you’ll probably want to add more white than blue. Then use your third brush to blend the two colors together. Add a bit of extra paint, if necessary, and don’t forget to paint the sides and front so everything matches! Wait for the paint to dry (you can speed this process up by using a hair dryer on low/cool). While the paint is drying, ready your embellishments! I filled my bottles and tied twine around my starfish. Last, I draped some netting over the box’s top and front (secured with hot glue at the back). Simple but cute! I kept mine pretty simple, but you could definitely add more embellishments. I think some scrapbooking elements would look really nice, especially dimensional ones, and extra shells would certainly fit. And how about some glitter in one of the bottles? Or glitter mixed in with sand? I’ve been trying hard to keep glitter out of the house, but I was really tempted to pick some up for this project. 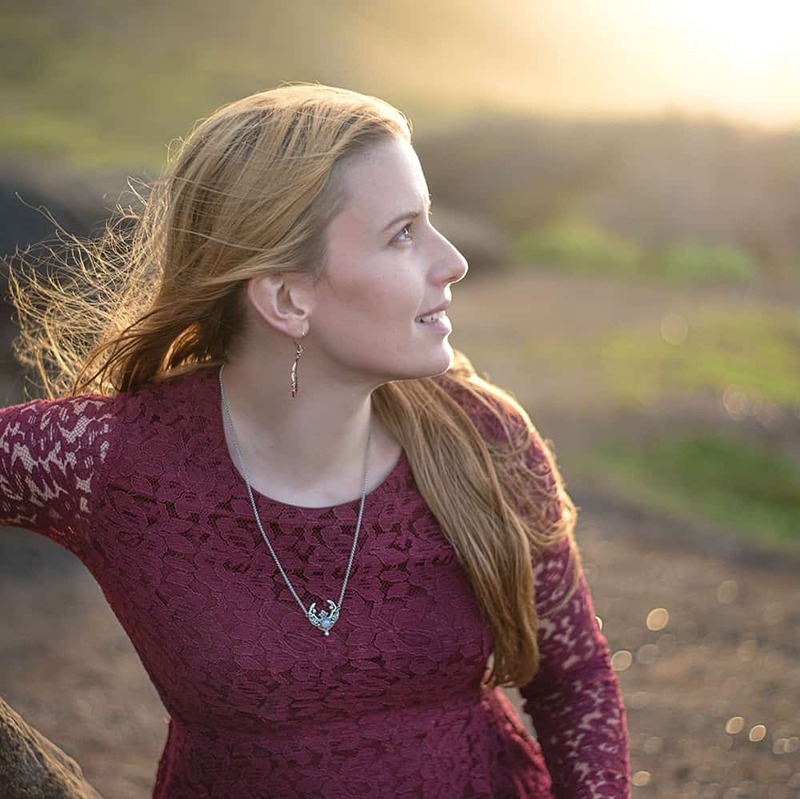 Can you tell the sun was totally in and out from behind cloud cover during this project? Actually, it was back and forth between pouring rain and bright sunshine. That’s life on the Windward side of an island for you! I know some people really aren’t into seasonal decor. How about you? Do you like a few seasonal pieces or do you really prefer to avoid pulling out new things with the passing months? This is so cute…! Would also be neat to have different boxes for different beaches around the world with the sand from each place, etc..! I might need to start doing that! That would be so much fun! I’m sure you’d have quite the collection.